Is Hanukkah still a relevant holiday? Is it relevant to non-Jewish people? Is it more than giving out gifts and eating fattening foods? YES. Hanukka is about King Antiochus Epiphanes, a real person, who about 2,183 years ago decided that the best way to control the Hebrew people was to uproot their religion, disconnect them from their core values and replace them with hedonistic Hellenistic values. Many Hebrews embraced this change. but a small band of Religious "Fundamentalists" opposed them and started guerilla warfare. They were fighting for traditional values, for their traditional way of life and for independence. Today many have forgotten the true roots of the holidays, it is not about gifts, it is about values, it is about standing up for what you believe, it is about being willing to fight for your religious freedoms. So Mattathias the Cohen, the priest, cried out "Whoever is for G-d come join with me!" His five sons and many brave followers joined. Led by Judah the Maccabee, Judah "The Hammer", they hammered away at the enemy until victory was achieved. May it be as we say, "In those days, at this time". The struggle continues. Happy Hanukkah everyone. ..from among them descended a wicked individual, Antiochus Ephiphanes, the son of King Antiochus....In those days days there arose out of Israel a group of bad people, who misled many of thier people. "Let us enter into a treaty with the pagens around us", ...many joined. They build a stadium in Jerusalem, in the pagan style. They removed the marks of thier circumcision, and rejected the holy Covenant. They intermarried with the pagens, and turned to evil ways. ..after conquering Egypt, Antiochus turned back and marched against Israel and Jerusalem with a strong force. In his arrogance he entered into the Trmple, and carried off the golden alter, and the lamp for light and all the holy equipment...he massacred many people and gloated over all he had done. Great was the sadness throughout Israel. Rulers and elders groaned, girls and young men were depressed. the beauty of women faded away. and the whole house of Jacob was clothed in shame. Antiochus attacked Jerusalem by tricking the people. he suddenly attacked the city, He dealt it a powerful blow, and killed many people of Israel. He plundered the city, setting it ablaze. and they took the women and children captive, and seized the cattle. Israel's Temple became desolate, her festivals turned to mourning, her Sabbaths to shame, her honor to contempt. Then the King issued a decree throughout the land that they should all become one people and abandon their own laws and religions...and many in Israel agreed, sacrificing to idols and profaning the Sabbath. ....In those days Mattathias, son of Johanan, son of Shimon of the family of Joarib, moved from Jerusalem and settled in Modin. He had five sons; Yohanan, called Gaddi, Shimon called Thassis (the zealous one), Judah, called the Maccabee, (the Hammer, for his heroic hammering of the enemy), Eleazar, called Auran, (the piercer)and Yonatan, called Apphus (the cunning one). Mattathias the elder spoke, and said "Though all the nations in the king's dominions obey him and forsake each of them the religion of his ancestors, and have chosen to follow his commands, yet I and my sons and brothers walk in the covenant of our fathers. We shall not abandon our laws and our Torah. We will not obey the decree of the king by departing from our ways, either to the left or to the right." Mattathias said in a loud voice that he and his sons would not obey the new pagan laws. When he ceased speaking these words, a Jew stepped forward, in full view of all, to sacrifice upon the pagan altar in Modiin, in keeping with the king's decree. When Mattathias saw him, he was roused to indignation; his soul was stirred. With righteous anger he rushed forward and slew him on the altar. At the same time he killed the officer sent by the king to enforce the sacrifice, and pulled the altar down. Thus Mattathias showed his zeal for the Torah, as did Phineas long ago by killing Zimri ben Salu. Mattathias shouted, "Follow me, every one of you who is zealous for the Torah, and wishes to maintain the covenant." He and his sons fled to the mountains, and left all that they possessed in the town. Thus began the Revolt of the Jews against the Romans, and thus begins the story of Hanuka. So dear friends, know what you are celebrating, the victory of good over evil, of faith over convenience. At that time many who wanted to uphold their faith and righteousness went down to the wilderness to settle there, with their sons, their wives and their cattle, because misfortunes had fallen hard on them. And it was reported to the king's officers and the troops in Jerusalem, the city of David, that men who had disobeyed the king's order had gone down to the hiding places in the wilderness. A large force pursued them, overtook them, and occupied positions opposite them. They prepared to attack them on the Sabbath day. "It will be enough," they shouted to them, "If you will come out and do as the king commands; your lives will be spared." But the Israelites answered, "We will not come forth, nor will we obey the king's commands to desecrate the Sabbath day." Then the kings troops attacked them. The Israelites did not defend themselves; they neither threw a stone against them, nor did they barricade their hiding places, for they said, "Let us all die with a clear conscience. We call heaven and earth to testify that you destroy us unlawfully." So, they attacked them on the Sabbath, and they were massacred, they, their wives, their children and their cattle, a thousand people. When Mattathias and his friends heard the news, they mourned bitterly over them. They said to one another, "If we all do as our brothers have done, and do not fight against the pagans for our lives and for our laws, they will soon destroy us from the face of the earth." On that day they decided, "If anyone attack us in battle on the Sabbath day, let us fight against him, rather than all die, as our brothers did in their hiding places." (This decision has held as Jewish law from that day onward, to this very day). It was then that Mattathias and his sons were joined by a company of Hasidim, strong Israelite loyalists, each one willingly offering himself in the cause of the Torah. And all who fled from harsh treatment joined them, and added to their strength. They organized an army and struck down sinners in their anger, and in their wrath those who violated the Law. And Mattathias and his friends went about the country and tore down pagan alters, and circumcised by force as many of the uncircumcised children as they found in Israel's borders. So they rescued the Torah from the hands of hte pagans and their kings, and would not let the sinners triumph. When the time drew near for Mattathias to die, he said to his sons; "arrogance and reproach have grown strong. This is a time for destruction and anger. My children, be zealous for the Torah, and give your lives for the covenant of our fathers. Remember the deeds they did in ther generations, and great glory and everlasting fame shall by yours. Was not Abraham faithful in time of trial, and so gained credit righteousness? Joseph in his time of distress kept hte commandments, and became Lord of Egypt. Phineas, our ancestor, for his zeal received the promise of eternal priesthood. Joshua kept the Law and became a judge in Israel. Caleb for bearing witness in the congregation gained inheritance of land as his reward. David for being merciful inherited the throne of an everlasting kingdom. Elijah, because of his love for the Torah, was taken up to heaven. none who trust in Him lack strength. And so not fear a wicked man's words, because his glory will end in filth and worms. Today he may be in high honor, but tomorrow he will be nowhere found, because h will have returned to the dust, and the memory of him will have vanished. But you, my children, be strong and courageous for the Torah. Then Mattathias blessed them and gathered to his fathers. and his sons buried him in the tomb of his fathers in Modiin. Then his son Judah, who was called Maccabee, 'The Hammer', took his father's place. He had the support of his brothers, as well as all his father's followers, and they fought Israel's wars with spirit. ..he was a like a lion in his actions, like a lion's cub roaring for its prey. ...he went among the towns of Judea, he destroyed the godless there, and turned away the anger from Israel. Now Apollonius gathered together a large pagan army from Samaria, to fight against Israel. When Judah heard of this, he marched out to meet him and he defeated and killed him. Many fell wounded, and the rest made their escape. Then they took their weapons, from among which Judah took the sword of Apollonius, and fought with it for the rest of his life. When Seron, the commander of the Syrian army, heard that Judah had gathered a force of faithful men about him, many of them experienced in warfare, he said, "I will make a great name for myself and achieve a reputation in the empire by making war on Juda and those that rebel against the king's command." And with him marched a strong expedition of godless men, to help him take vengeance on the Israelites. When he reached the pass of Beth-Horon, Judah moved forward to meet him with a small company of men. When his followers saw the army coming against them, they said to Judah. "How can so few of us in number fight against so many? Besides, we are weak, for we have had nothing to eat today." Judah replied: "Many can be overpowered by a few. It makes no difference to Heaven to save by many or by few. Victory in battle does not depend on the size of the army, but rather on strength that comes from Heaven. They are coming against us, full of violence and lawlessness, to destroy us, our wives, and our children. They come to plunder us. But we are fighting for our lives and our religion. He Himself will crush them before us. You have no need to fear them." When he finished speaking, Judah launched a sudden attack, and Seron and his army were crushed before him. They pursued them from the pass of Beth-Horon to the plain, and about eight hundred men were slain; the rest made their escape into the land of the Philistines. It was then that he fear and dread of Judah and his brothers began to spread among the pagans around them. His face reached the attention of the king, and the story of his battles was told among all the peoples. When King Antiochus heard these reports, he was enraged, and he gathered together all the forces of his empire, a very powerful expedition. He opened his treasury, gave his forces a year's pay, and ordered them to be prepared for any duty. He handed over to Lysias half of his armed forces, and the elephants. He gave him orders about everything he wanted done, especially about he inhabitants of Judea and Jerusalem. Against these Lysias was ordered to send an army to root out and destroy the strength of Israel and the remnant of Jerusalem, to erase their memory from that place. He was to settle foreigners in all their borders, and to distribute their land among them. Then the king took the remaining half of his armed forces and set out from Antioch, his royal city, in the year 147 (165 B.C.E.) He crossed the Euphrates River, and marched through the upper provinces. Meanwhile Lysias chose Ptolemy, son of Dorymenes, with Nicanor and Gorgias, mighty men of the Friends of the King, and sent with them forty thousand infantry and seven thousand cavalry, to go to Judah and to destroy it as the king had commanded. They set out their forces and encamped near Emaus in the plain country. An army from Syria and Philistia joined Lysias, too. When Judah and his brothers saw that their plight had become critical, and that armies were camping on their borders, they knew too, of the orders which the king had issued for the complete destruction of the nation. So they said to one another, "Let us repair the evil fortune which has come upon our people; let us fight for our nation and for the Temple." They gathered together in full assembly to be ready for war, and to pray and to seek divine mercy. They gathered together at Mitzpeh, opposite Jerusalem, for in earlier times Israel had a place of prayer in Mitzpeh. That day they fasted, put on sack-cloth, put ashes on their heads, and tore their garments. They unrolled the scroll of the Torah, upon which the pagans had drawn likeness of their idols. They brought out the priestly garments and the first fruits and the tithes; they gathered the Nazirites who had completed their vows, and they cried to Heaven, "What shall we do with these Nazirites, and where shall we take them? Your Temple is trodden down and defiled, and Your priests are grieved and humiliated. See how the pagans have gathered against us to destroy us. You know what they design against us. How shall we be able to stand our ground before them, unless You help us?" Then they sounded the trumpets and shouted with a loud voice. After this, Judah appointed officers over the people, leaders of thousands, and hundreds and fifties and teens. But he ordered those who were building their houses, or were newlywed, or planting vineyards, or were fait-hearted, every one of them to return home, as the Torah commands. Then the army moved and encamped to the south of Emmaus. Judah instructed them, "Prepare yourselves for action and show yourselves to be brave men. Be ready at dawn to fight against the pagans who are gathered together against us, to destroy us and our Holy Place. Better to die fighting than to witness the ruin of our nation and our Sanctuary. As may be the will of Heaven, so shall He do." Then Gorgias took five thousand men and a thousand picked cavalry, and his army marched out by night. So as to fall upon the encampment of Judah and attack them unawares. When Judah heard of this, he and his valiant men moved to attack the king's army in Emmaus. Gorgias came into the camp of Judah during the night but found no one there. He hunted for them in the mountains, thinking 'they are hiding from us'. At day break, Judah appeared in the plain with three thousand men, though they did not have all the armor or the swords they wanted. They saw the camp of the pagans strongly fortified, with mounted guards, experienced troops, patrolling it. Judah said to his men, "Do not fear their numbers or panic when they charge. Remember how our fathers were saved at the Red Sea, when Pharaoh and his army pursued them. Let us now cry to heaven to have His mercy upon us, to remember the covenant made with our forefathers, and crush this army before us today. Then all the pagans will know that there is One who liberates and saves Israel." Then the foreign troops raised their eyes and saw them marching forward and they came out of the camp to give battle. Judah's men sounded the trumpet and attacked. The pagans broke and fled to the plain; those who were in the rear fell by the sword. They pursued them as Gazara and the plain of Idumea and Ashdod and Yabne; about three thousand of the enemy were killed. Judah and his army then returned from pursuing them, and he said to his men, "Do not be greedy for plunder, for there is another battle before us. Gorgias and his army are in the nearby mountain. Stand firm now against our enemy and fight!" Before Judah had finished speaking, a detachment of them emerged from the mountain. They saw that their army had been routed and that they were burning the camp. The sight of the smoke showed them what had happened. They were greatly alarmed, as they took in the scene. And when they saw the army of Judah on the plain, ready for attack, they all fled to the land of the Philistines. Then Judah turned back to plunder the camp, and they took much gold and silver, blue and purple cloth, and great riches. On their return they sang a song of thanksgiving and blessed Heaven. "for He is good, for His mercy endures forever." And Israel had a great deliverance that day. Those of the enemy who escaped with their lives came and reported to Lysias all that happened. When he heard it, he was overcome with discouragement, because Israel had not suffered the disaster he had wished for, nor had it turned out as the king had ordered. In the following year he gathered together sixty thousand elite infantry and five thousand cavalry to make war on the Jews. They marched into Idumea, and encamped at Beth-Zur, Where Judah met them with ten thousand men. When he saw the strength of the enemy expedition, he prayed and said, "Blessed are You, Savior of Israel, Who stopped the charge of the mighty giant by Your servant David. You did deliver the camp of the Philistines into the hands of Jonathan son of Saul, and of his armor-hearer. In like manner put this camp into the hand of Your people Israel. Let them be ashamed of their army and their cavalry. Make them cowardly and melt the boldness of their strength. Let them tremble at their destruction. Strike them down with the sword of those that love You, and let all who know Your name praise You with songs of thanksgiving." Then they joined battle, and Lysias lost about five thousand men in the close struggle. When Lysias saw that his army was routed, and that Judah had grown bold, and was ready either to live or to die nobly, he departed for Antioch. There he collected mercenary troops, in order to return to Judea with an even larger army than before. But Judah and his brothers said, "Now that our enemies are crushed, let us go up to Jerusalem to purify the Holy Temple and rededicate it." So the whole army gathered together, and they went up to Mount Zion. There they found the Temple laid waste, the alter profaned, the gates burned down, the courts overgrown like a forest or a wooded mountain, and the priests' quarters torn down. They tore their garments, uttered great lamentations, covered their heads with ashes, and fell on their faces to the ground. Then they sounded the ceremonial trumpets, and cried to Heaven. Then Judah appointed special troops to fight the garrison in the citadel, until he could cleanse the Temple. He selected priests (Cohanim) without blemish, devoted to the Torah, and they purified the Temple, removing to an unclean place the stones which defiled it. On kindle, Amazon, or directly from IKI. 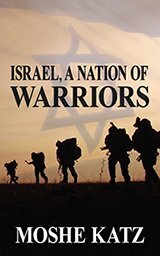 Understand the history of Israel as a fighting nation. From the first Hebrew, Abraham, to our own times and the Israeli Defense Forces. Airport security, the history of Krav Maga, the Biblical fighters, post Biblical fighting, the Jewish partisans, American Jewish soldiers, Soviet Jewish soldiers and much more. Required reading for IKI instructors.